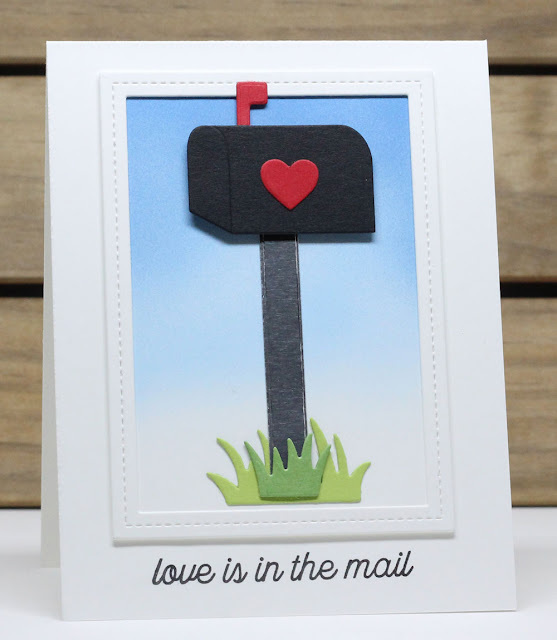 My first card uses the new Mailbox Die-namics and Love Is in the Mail stamp set. I kept the card clean except for some Copic airbrushing in the background. I masked off the rectangle and then framed the scene with a Single Stitch Line Rectangle Frame. I love your super cute card with that mailbox! I just ordered mine and can't wait for it to arrive. This is such a fantastic release! I really like how you sponged your sky! It makes such a great background! I love how you framed the mailbox! This card proves you can make wonderful cards primarily just using dies with a tiny bit of stamping. It's really cute! I really love the card you did that had the mailbox Die namics on it. Very cute! I like your little mailbox scene with the sponged sky and flag sticking up! I love the simplicity of this one!! Love this die set, make such fun cute cards. Jody this is another fab release! Love that mail box. Really cute card!! I love your design and the background is perfection! Thanks for sharing your fun card with the mailbox. I love how you used the frame and sponged the sky. Love the way you did the background. Love the mailbox die. Adorable! This little mailbox is so fun!! your simply stated card makes me want to open the mailbox! I love the focus on the mailbox. I'd be tempted to always add some critter somewhere, but this really works. Great card. The mailbox is adorable. A great idea for this set. Love this! That mailbox is perfect and I can think of lots of reasons to use it. So sweet and simple! Love it! This little mailbox is so adorable - love the card! Your card is so cute! That mailbox is so adorable! Cute card! Love this release! Love this card..Thanks for sharing and inspiration!! Amazing new Products this month!! How cute! I like how the mailbox pops against the blue background...awesome card! I love that 3d mailbox and your fab ombre background! I just love that little mailbox. Such a cute card. Cute scene and sentiment. Love your mailbox! Definitely my favourite product of this release - this die is simply fantastic! Lovely card! I like this and it looks super easy to assemble for mass production. Great design! love that you framed this iconic image. Delightful in color and design!! Love it! Love the mail box dies. Very cute card. Adorable!!! And such a sweet sentiment. So cute. I like the heart on the mailbox. Perfect CAS card!! Love the inking!! Cute card! That is such a fun die set! Sweet card! I really like this mailbox die and the way you framed it is perfect. Love this! This sentiment is the best! That is adorable Jody. I love the sentiment. Sweet card! My order is on the way! I love that such a simple scene can be so perfect! Love everything about it! together like peanut butter and jelly. Jody, your mailbox looks so real with the blue sky peeking behind it and the grass beneath it. Love that sentiment, too. Fun release! I LOVE the mailbox--so cute! This mailbox is so cute! What a lovely clean and simple card! Lovely card - everyone needs real mail, don't they? Very sweet card. I really like this new mailbox die - lots of possibilities. Very clean and simple card, I really like it! This mailbox die is very cute. Love that you can use it both opened and closed. So very sweet!The mailbox is adorable! Truly the definition of happy mail -- so cute!! I love the simplicity of your cute card. It seems like cards using this die set would go together quickly. Thank you for sharing! Love your simple, clean and cute card. Awesome card! The blending is amazing! Great card, great clean and simple design! I love that mailbox - what a cute card! So clean and simple! I always think I need to add more!